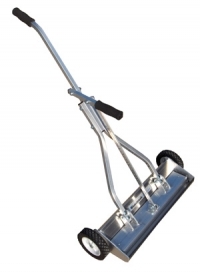 Designed for roofers that want a lighter sweeper but with all the features of quick clean off, height adjustability and durability. Also designed for use on grass because of its unique wrap-around design that prevents debris from being wiped off by long grass or weeds. The debris simply snaps around on to the back of the sweeper.